Thank you for your interest in our summer research fellowship program for international students (i-REU). 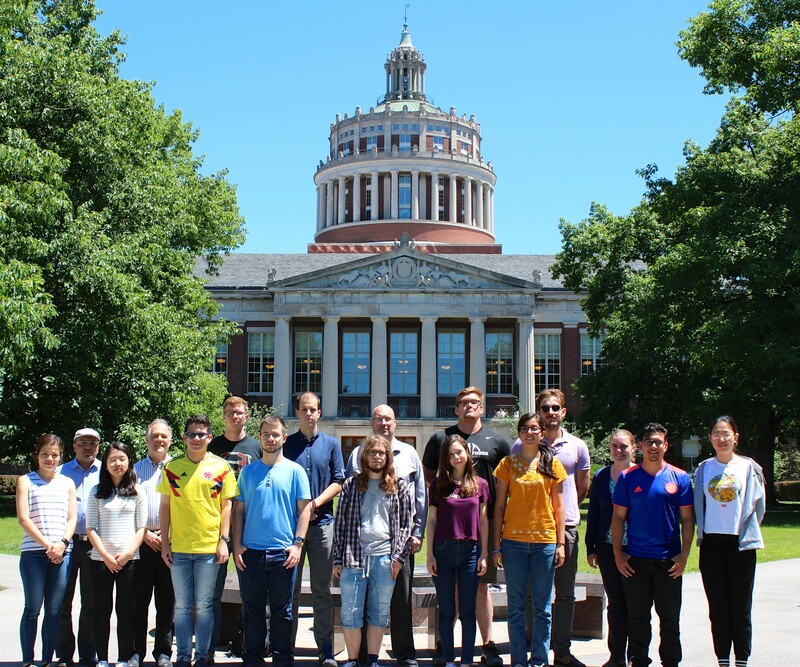 This highly competitive program is designed to provide young promising undergraduates in Chemistry from all over the world the opportunity to conduct first class research for 8-10 weeks at the University of Rochester. The program is meant for outstanding students that intend to enter into a PhD program in any area of Chemistry in the Fall of 2020 or earlier. The standard period of the 2019 i-REU program is from May 28 to August 2. Alternative starting dates within the summer period will be considered in exceptional circumstances and on a case-by-case basis. Through the program, participants receive a weekly stipend of $450 (~$1800/month), health insurance during their stay, and up to $1000 toward travel costs. The program also covers any associated registration and tuition fees. The stipend is meant to cover living expenses (room and board) during your stay in Rochester. Through the International Student and Global Engagement Office, we will assist you in securing on-campus housing and a US Visa to conduct research at the University of Rochester. Complete and submit an online application. Make sure to attach a (unofficial) copy of your transcripts (with English translation) and a copy of your CV in PDF format. Provide contact information of two professors that are familiar with your work to serve as reference. A copy of your application and instructions on how to submit their reference letter will be sent to them from summer@chem.rochester.edu. Please follow up with your references to make sure that they have received this email. Note that this automated email is sometime filtered as spam. You will receive via email a copy of your submitted application and confirmation when your recommendation letters are received. For full consideration, all application materials and recommendation letters should be sent by February 1, 2019. Below is a list of frequently asked questions regarding the i-REU program. Please consult this section before requesting additional information at summer@chem.rochester.edu. We will be happy to address any other questions you may have. I still have more than one year to graduate from my Bachelor’s degree. Am I eligible? Yes, you are eligible and we have had participants in the program that have come relatively early in their undergraduate degree. However, because of the competitive nature of this program preference is given to students that are planning to start a PhD in chemistry in the immediate future (within the next 18 months from the time of the program). I recently finished my Bachelor’s degree and I am currently working/pursuing a Masters. Am I eligible? Yes, you are eligible if you are planning to start a PhD program in chemistry in the immediate future (within the next 18 months). I am already pursuing a PhD. Am I eligible? I am an international student currently studying in the US. Am I eligible? No. The focus of this program is on students presently attending university in countries other than the US. I am a student in a field different than chemistry. Am I eligible? Yes, provided that your field is of study is related to chemistry (e.g. physics, biology, engineering, computer science, etc.) and that you plan to do a PhD in chemistry. What should I expect from this experience? You will be doing research full time under the supervision of a faculty member of the chemistry department. Your specific project will depend on the group that you are assigned to. You will live on campus for most of your stay. You will also be given the opportunity to participate in a seminar series and a poster event that is designed for Summer Research Students. There will be several opportunities for networking throughout the summer. Are there courses associated with this program? No. However, there is a seminar series that is geared toward summer research students. If I am accepted, how long should I stay? All participants are required to stay for at least eight weeks, and for a maximum of ten weeks. The period for this program does not coincide with school breaks in my country. Am I eligible? Absolutely. While we do try to bring all participants around the same period of time, we understand that school periods vary from country to country and may not necessarily coincide with the US college calendar. In your application, please be very clear about your time availability as we use this information to establish a set of dates that works. Nevertheless, there are several reasons why coming in the preferred period is best. First, during this period there are other undergraduate students doing research in the department, giving you access to a network of peers during your stay, and to a series of events that are catered specifically to this group. Further, on-campus residences are only available during a fixed period during the summer. Thus, coming off-season may imply finding off-campus accommodation. When will I know whether I have been selected for this program? Decisions and offers will be made in the last week of March. My country of origin doesn’t appear in the list of possible countries in the website. Can I apply? Absolutely. Please use option “other” in Country and Country of Citizenship in the application form, and manually enter the name of your country. I cannot convert my grades to the percentile system (0 lowest, 100 highest) in the website as the two grading systems are not compatible. What do I do? In most cases it should be possible to express your grade as a percentage. If this type of conversion is impossible in your case, then just leave your grades in their original format and add a few sentences in your personal statement that help us understand them with precision. I am concerned that my grades may not look strong on a percentage scale even when I am a top performer. What do I do? We understand that grading practices change from country to country, and we have a reasonable sense of grading systems around the world. However, to help us understand your grades better we encourage you to add a sentence or two in your personal statement explaining the grading system in your country, and how do you rank among your peers. If I am at the Masters level, should I submit grades of my master's and bachelor’s degree? Yes, you should submit grades from both your masters and bachelor’s degree. What is a CV and how do I construct it? Can the request for letters of recommendation be sent before I complete my application? No. Request for letters will only be sent once you submit your application. Make sure that your letter writers are aware that this is coming such that they can be ready by the time that you complete your application. Can I translate my own transcripts? Yes. Your own faithful translation of your transcripts is acceptable. Do I need an official English test score to apply? Is it acceptable to submit only one recommendation letter from a senior scientist? Yes, it is acceptable. However, having two different letters from senior scientists would make your application more competitive as it helps us understand your profile and accomplishments better. 2017 Participants of the International Summer Fellowship Program with faculty advisors. Front Row: Fredrik Valgeborg (Sweden, Physical Chemistry), Alessandro Rognoni (Italy, Theoretical Chemistry), Ana Claudia Fingolo (Brazil, Physical Chemistry), Pawel Wójcik (Poland, Physical & Theoretical Chemistry), Jiwon Han (South Korea, Inorganic Chemistry), Jakub Vaith (London, Organic Chemistry). 2017 International Summer Students with mentors and faculty advisors. 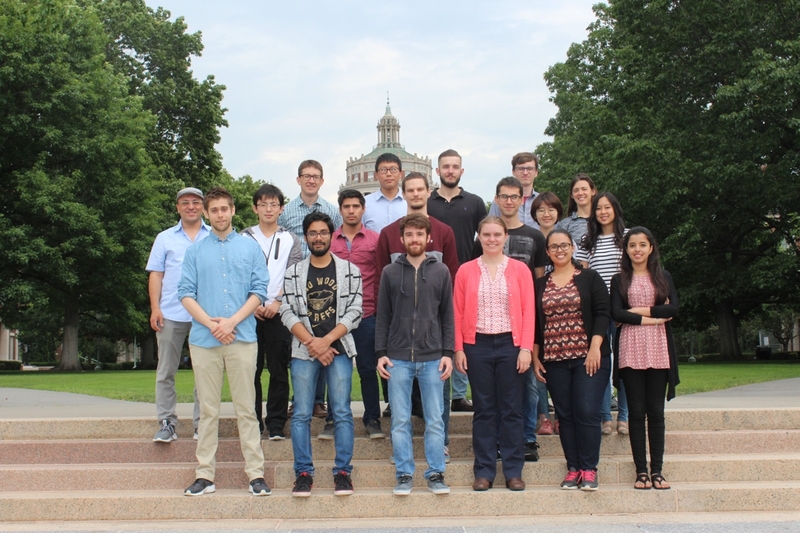 Bottom Row: Fredrik Valgeborg (Sweden, Physical Chemistry), Sutirtha Chowdhury (Mentor), Alessandro Rognoni (Italy, Theoretical Chemistry), Katie Knowles (Advisor), Ana Claudia Fingolo (Brazil, Physical Chemistry), Mehrin Tariq (Mentor). 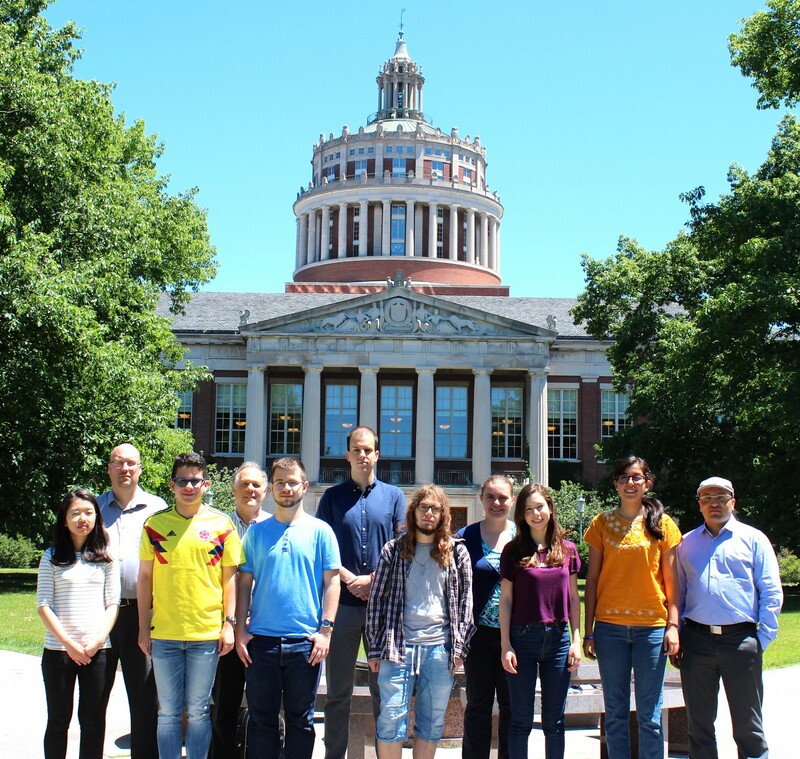 Second Row: Ignacio Franco (Advisor/Coordinator), Xinyang Li (Mentor), Antonio Garzon(Mentor), Zachary Piontkowski (Mentor), Pawel Wójcik (Poland, Physical & Theoretical Chemistry), Jiwon Han (South Korea, Inorganic Chemistry), Jennifer Le (Mentor). Back Row: David McCamant (Advisor), Frank Huo (Advisor), Georgios Alachouzos (Mentor), Jakub Vaith (London, Organic Chemistry), Alison Frontier (Advisor). 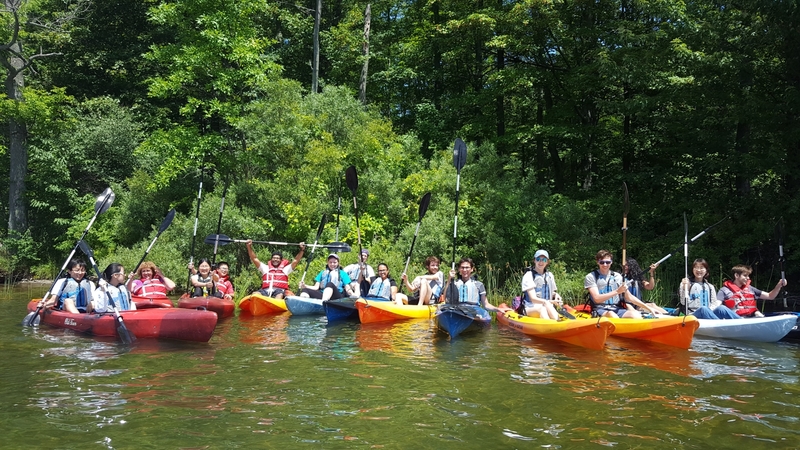 2017 International Summer Students, some of the U.S. REU visiting students, mentors , staff, and a couple faculty members traveled to Canadice Lake, south of Rochester, to kayak for 3 hours. It was a beautiful day and a lot of fun was had by all that attended! 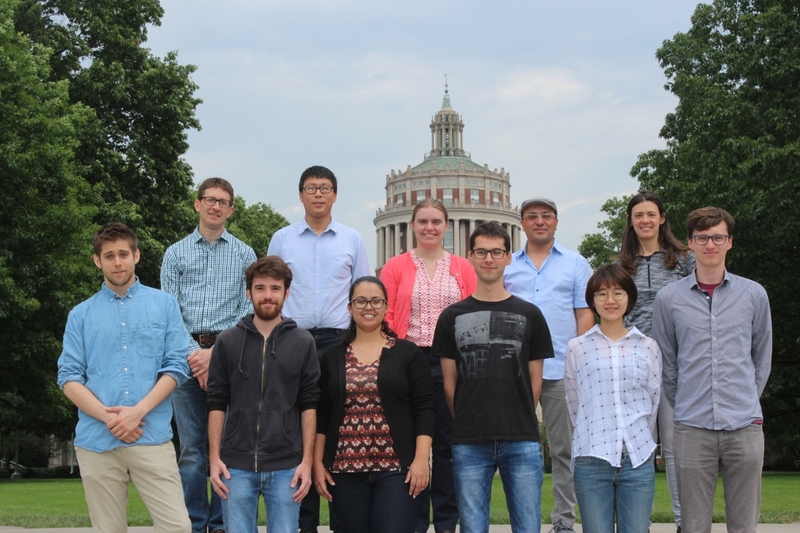 Pictured here, from left to right: Xinyang Li, Jing Wu (Xingyang’s girlfriend), Barb Snaith (Chemistry Administrative Assistant to the Chair), Zhi Wu, Zhenguo Wang (Zhi’s husband), Sharma Yamajala, Prof. Katie Knowles, Prof. J.C. Olsen, Ana Claudia Fingolo, Alessandro Rognoni, Pawel Wojcik, Perry Hicks, Jasmine Gomez, Jakub Vaith, Jiwon Han and Fredrik Valgeborg. 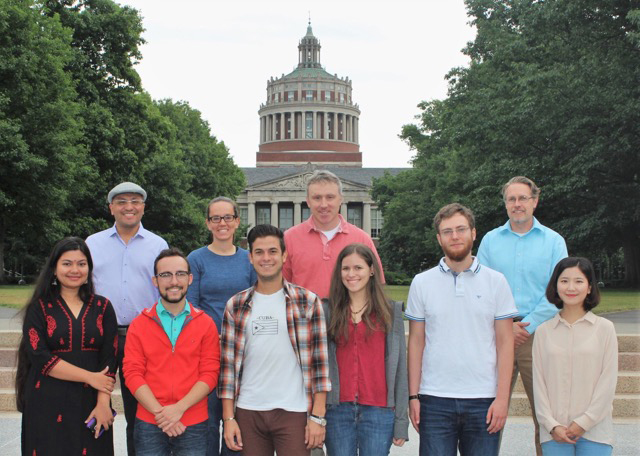 2016 Participants of the International Summer Fellowship Program with faculty advisors. Top row from left: Professors Ignacio Franco, Ellen Matson, Todd Krauss, Bradley Nilsson (Not pictured: Professors Kara Bren and Frank Huo). 2016 International Summer Students with mentors and faculty advisors. Not pictured: Professors Kara Bren (UR, Inorganic Chemistry) and Frank Huo (UR, Physical Chemistry). 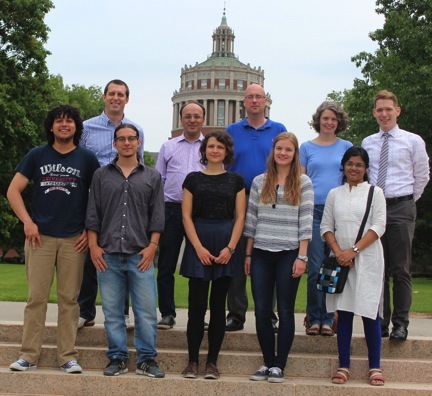 2015 Inaugural participants of the International Summer Fellowship Program with faculty advisors. Bottom row: Ulises Torres (UNAM, Mexico, Physical Chemistry), Leopoldo Mejía (U. Antioquia, Colombia, Physical Chemistry), Viktoria Steck (Humboldt U. of Berlin, Germany, Organic Chemistry), Dieuwertje Modder (U. Netherlands, Inorganic Chemistry) and Manjista Mukharjee (Calcutta U., India, Inorganic Chemistry). Top row: Professors Rudi Fasan, Ignacio Franco, Michael Neidig and Kara Bren. Ted Pagano (top right corner) from the Center for Study Abroad and Stephanie Krause (not pictured) from the International Student Office were instrumental in successfully bringing these students to Rochester.